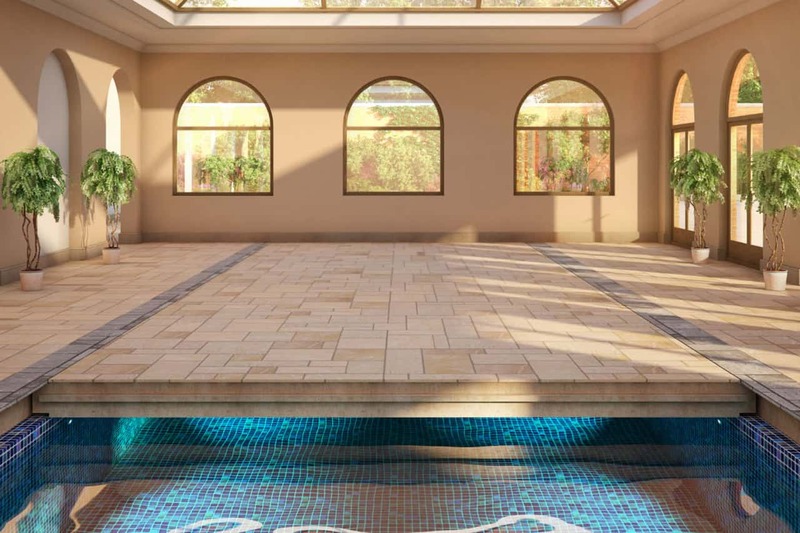 Having a swimming pool fitted in your home, whether it be an indoor or outdoor swimming pool can often take up a large amount of space and the pool is usually only used for a couple of hours each day. The ability to increase the use of the pool area is becoming more popular, even more so as a property developer looks to maximise the value of a property. A moving pool floor can allow the swimming pool area to be converted into useable floor space, this means the area can be used to entertain parties or even conferences or maybe just an area for the kids to play on. A moving floor also creates the ability to change the depth of the water in the pool which means as the children grow in size and improve swimming ability you can make the pool deeper. Imagine being able to have shallow water in the morning while the kids are playing, and then changing to full depth for a healthy, energetic swim later in the day, then in the evening, you can convert the same space into an area to entertain friends, family and guests. Your swimming pool no longer needs to be an area of the house that isn’t used as much as you’d like. The pool water depth can be adjusted with the touch of a button. The ability to set the floor to a predetermined level for event requirements. A moving floor allows you to create a safer swimming environment for children. Your swimming pool can easily be adjusted for individuals with special needs. Always create a safe and secure environment by raising the floor. Create a usable space when the swimming pool isn’t being used. Raising the floor can lower energy costs and reduce condensation. A moving floor can be installed on indoor and outdoor swimming pools. A moving floor is suitable for both commercial and residential swimming pools. By fitting a quality moving floor you create the ability to turn your indoor pool into a useable space, maybe a dining room or a playroom and with an outdoor pool you can create a beautiful patio area or a parking space and all at the press of a button, and a moving floor can be fitted to pools of any shape or size. The moving floor system is often operated by air cylinders, this means there are no cables lying around, electric motors or hydraulic systems to be concerned about, using a few grammes of air pressure, the system can lift or lower to different heights. Supporting braces are deployed to stabilise the floor, these are simply legs that are attached to the underside of the movable floor. Moveable floors can be provided with a range of programming capabilities that offer multiple uses of the same space.